Mahogany takes a turn for the musical in this Frank Lloyd Wright-inspired design. Perfectly pitched roof of brown copper patina harmonizes happily with the clean Prairie-style lines of the house, which, like all Heartwood Homes, is carefully hand-crafted right here at our Star, Mississippi facility. It s also nice to know that our approach to mahogany is eco-friendly, offering more than a measure of comfort that s real peace of mind! Comes with mounting plate. 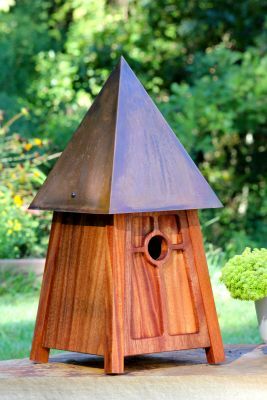 Frank Lloyd Wright inspired mahogany bird house has a perfectly pitched brown copper patina roof. Comes with a mounting plate with ventilation,clean out and drainage built in. 1 1/2" access hole.